Ciao! I’m Melissa, the “crazy linguist” – la studentessa matta! In Italian, “matta” means “crazy” or “impassioned”. Through my books, blogs, videos, podcasts, social media and programs to learn Italian in Italy, I promote the study of Italian language and culture. 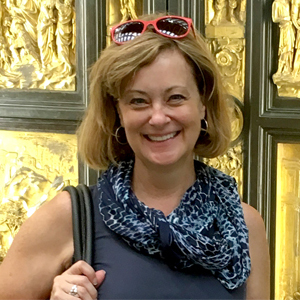 I also coordinate Matta Italian Language Immersion Tours, which I co-lead with Italian partners in Italy. As a student, I lived in Florence with an Italian family. I studied art history and painting and took a beginner, Italian classes. When I returned home, I threw away my Italian dictionary, assuming I’d never need it again. But after launching a successful design career and starting a family, I realized something was missing in my life. That “thing” was the connection I had made with Italy and the friends who live there. Living in Florence was indeed a life-changing event! Wanting to reconnect with Italy, I decided to start learning the language again from scratch. As if indeed possessed by an Italian muse, I bought a new Italian dictionary and began my journey to fluency—a path that has led me back to Italy many times and enriched my life in countless ways. Now, many dictionaries and grammar books later, I dedicate my time to promoting Italian language studies, traveling in Italy, and sharing my stories and insights about Italy with others. When I’m not abroad in Italy, I live in the San Francisco Bay Area. I am married and have three boys and two beagles named Moka and Sinbad. 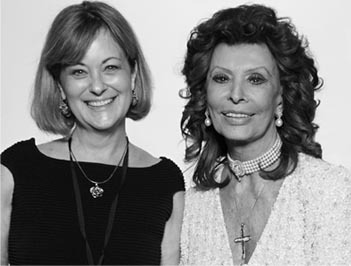 It was my great pleasure to meet Miss Sophia Loren, last year. She is as gracious and lovely in person as she is on the silver screen. I kissed her on both checks, spoke with her in Italian. What a thrill it was to hear her say: “I believe in dreams. Dreams become reality.” Thank you Sophia for helping to turn my dreams into reality.